Most of us are familiar with the crimson radish, and maybe even black radish and white radish (the shredded daikon served with sashimi). 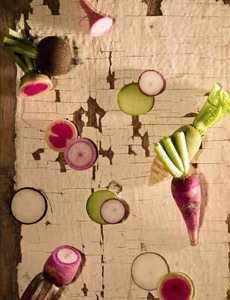 If you’re lucky, you’ve enjoyed the beauty of candy stripe radish (chioggia) and watermelon radish. 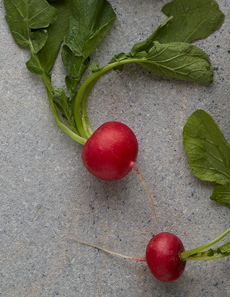 But if you’re a radish lover, take a look at these heirloom radishes. We’d never seen the Chinese Green Luobo Radish (Qingluobo), with lime-green skin and flesh; and the purple-skinned Malaga Radish that looks like a beet. Some radishes are small globes, others have pointy tips, still others are the shape of carrots or turnips. The amazing Rat’s Tail Radish from Thailand doesn’t look like a radish at all. It’s a very long, slender green pod with radish “seeds” inside, and was grown in U.S. gardens in the 1860s. The Zlata Radish from Czechoslovakia is the color of gold beets. Radishes, botanically known as Raphanus sativus, are actually cabbage relatives that originated in Asia. They are a member of the Brassicaceae family of vegetables that is famed for its anti-carcinogenic properties. There are small varieties for salads and radishes the size of potatoes that in pre-refrigeration times could be stored through the winter. Less familiar radish varieties. Photo courtesy SweetGreen. Growing radishes is easy. You can plant salad radishes in spring through fall in most locations. Repeated plantings ensure you’ll have fresh radishes until the frost. Whether you buy them or grow them, celebrate spring with this refreshing radish and asparagus salad. It’s from Katchkie Farm in Kinderhook, New York, which uses its micro arugula in the recipe. *If you can’t find blood oranges, see if the fresh juice section of the store has blood orange juice. Or, substitute orange or tangerine juice. ‡Substitute other microgreens or sprouts. 1. PEEL the asparagus and blanch in salted boiling water then shock in ice water, drain and reserve. 2. PREPARE the Blood Orange Vinaigrette. Whisk together the orange juice, vinegar, minced shallot, salt and pepper. Add the olive oil while continuing to whisk. Taste and adjust seasoning as necessary. 3. TOSS a bit of the vinaigrette with the asparagus. 4. WASH and trim the tops of the radishes so that some of the green is left. Cut each radish into four wedges and reserve. Peel the oranges, being careful to remove all of the pith, then separate the segments. Set aside and keep the orange remnants to use for the vinaigrette. 5. TOAST the pistachios in a dry skillet over medium heat. Remove and set aside to cool. 6. PLACE the radishes, oranges and pistachio in a salad bowl, then add the lemon juice, olive oil, salt and pepper. Toss together and adjust the seasoning to taste. 7. PLATE: Place four asparagus on each plate. Spoon the radish mixture on top. Garnish with some micro arugula and drizzle with vinaigrette.